Featuring the Royal Scottish Orchestra and Jean-Claude Picard, today sees the release of Staffa. Please see promo trailer on the right. If you would like to buy a copy from Amazon please follow this link or from Presto Classical please click here or to buy from iTunes click here. Thanks for your support. 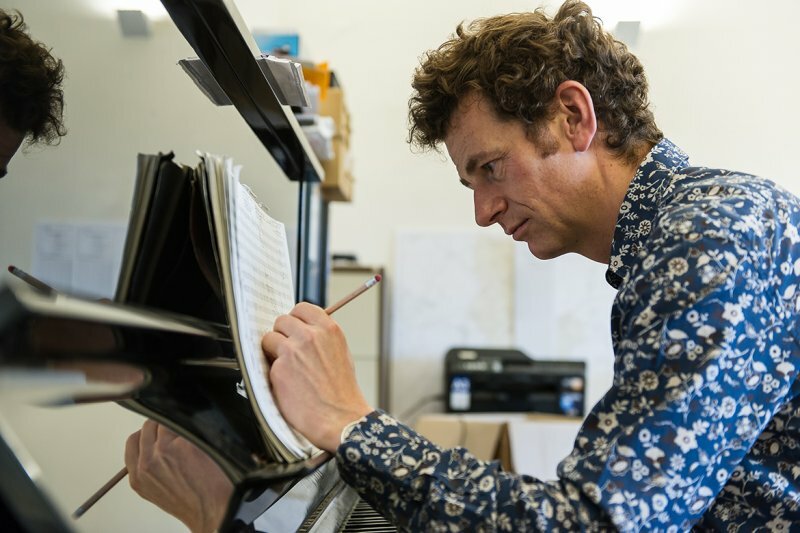 Staffa is the much anticipated collection of new orchestral works by acclaimed composer Ned Bigham. Building on the success of his first album of orchestral works Culebra, which reached no. 11 in the Specialist Classical Charts in 2014, Staffa looks set to solidify Bigham’s reputation as an artist whose tuneful music is accessible to a wide audience whilst having real compositional depth. The title piece, for orchestra and three large screens, was created in collaboration with BAFTA and Grierson award-winning visual artist Gerry Fox, and was premiered by the BBC Scottish Symphony Orchestra, conducted by Martyn Brabbins, at the 70th Anniversary Celebration Concert of the Edinburgh International Festival on 27 August and broadcast afterwards on Radio 3. Supported by Creative Scotland, Staffa also ran as a three-screen installation, with quadraphonic recording by the Royal Scottish National Orchestra, at the National Library of Scotland from 17-27 August, and drew crowds in excess of four thousand over the period. It has appeared in interviews/features on Radio 3 In Tune, Radio Scotland and Scottish TV among others. Scored for full symphony orchestra, celeste and two harps, Staffa dramatically evokes the fleeting moods of the Inner Hebridean island’s elemental location, with the marriage between sound and image unique and magical. Gerry Fox’s visuals pay homage to Mendelssohn's famous 1829 visit to its haunting Fingal's Cave by exploring the unique hexagonal, basalt column formations of the interior and its surroundings. Whilst inspired by Mendelssohn’s journey, Ned’s music is new and ground-breaking. The other works on the disc complement Staffa (in its stereo version) and demonstrate Bigham’s playful way with existing forms. The two sets of Archipelago Dances whisk the listener off to Bigham’s imagined islands in these vivid orchestral tone poems. Halmahera is scored for two pianos and orchestra, with the canonic piano parts delightfully performed by Lynda Cochrane and Judith Keaney. The irresistible Tegua takes the polka form as its starting point. The Two Nightscapes are mysterious and haunting, with the glorious harp writing in Serenade performed by Pippa Tunnell. The performance of Staffa by the BBC Scottish Symphony Orchestra at the Festival's 70th Anniversary Celebration Concert was rapturously received. It was broadcast on Radio 3 and you can listen by following this link. Staffa comes in around 1:07:38. Gerry Fox's visuals looked amazing, on three huge screens suspended above the orchestra-see preview on the right. The installation in the National Library of Scotland had record attendances, over five thousand during the ten days it was open. Both events were covered extensively on radio, press and Scottish TV. Here is a link to the interview with Ned and Gerry by Sean Rafferty on Radio 3 In Tune click here. At the National Library of Scotland, George IV Bridge, Edinburgh EH1 1EW. Admission free, open 10am till 6pm everyday until 27th August. Staffa new album on CD/iTunes is being released on 8th September. Please click on Listen tab above to preview. If you would like to pre-order a copy from Amazon please follow this link or from Presto Classical please click here or to buy from iTunes UK click here. Thanks for your support. Created by BAFTA and Grierson award-winning filmmaker Gerry Fox and acclaimed composer Ned Bigham, Staffa pays homage to Mendelssohn's famous 1829 visit to the haunting Fingal's Cave on the Hebridean island by exploring the unique hexagonal, basalt column formations of the interior of the cave and its surroundings. Whilst inspired by Mendelssohn’s journey, the work is new and ground-breaking. Supported by Creative Scotland, Staffa will be presented prior to the finale concert as a three-screen quadraphonic installation, with music recorded by the Royal Scottish National Orchestra, at the National Library of Scotland from 17-27 August. Using pioneering drone-mounted footage in three contrasting weather conditions; sunny, rainy and stormy, Gerry has been able to depict three simultaneous visions of the uninhabited island. Scored for full symphony orchestra, celeste and two harps, Bigham’s music dramatically evokes the different moods and the marriage between sound and image is unique and magical. The music will be available on CD in September on Aruna Records. The two recent commission premieres were well received. 'Music to hear', acappella setting of Shakespeare's Sonnet VIII, was beautifully performed by the combined choirs of Chichester, Winchester and Salisbury Cathedrals at the Southern Cathedrals Festival twelve days ago. 'Heaven shall call her from this cloud of darkness' was stunningly performed by the Brodsky Quartet at Champs Hill and St Mary's last week as part of the Petworth Festival.